Juna Bazaar is an old market place in the heart of Pune, often looked over by the residents of the city unless they want to specifically shop for something there. The market comes alive on two specific days in the week, Wednesday and Sunday, when there is a weekly market. There is exceptional buzz in the market and its a great place for taking pictures as well. In short it's a perfect place for Street Photographers like me who are looking for beautiful subjects to shoot. However, this time I did't want to shoot subjects, but actually talk to the people who make and run this market. These are the hard working people who work behind the scenes and run the marketplace. Their works usually happens in the narrow lanes behind the busy market, and they work all seven days, not just on two weekly market days. Who are these people? What is their life life? What do they dream of? Here are some of the dream stories I collected in Juna Bazaar of Pune. "My elder son died and now his children are my responsibility. I dream of giving them both good education and help them become something in life." After the battle of 'Haldi Ghati', many families from Rajasthan migrated to Maharashtra, and Radhabai's family was one of them. 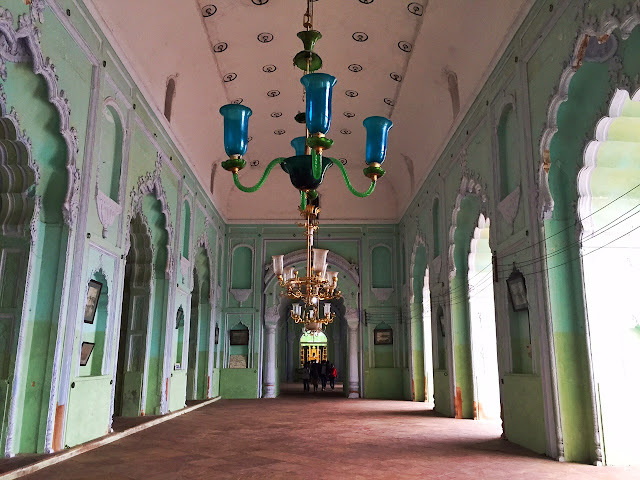 Her family has traditionally been 'lohars' or ironsmiths and they continued doing the same work here as well. She never went to school and started working in her family's business after she turned ten. Though traditionally it was done by both men and women, now there are very few women doing this work. 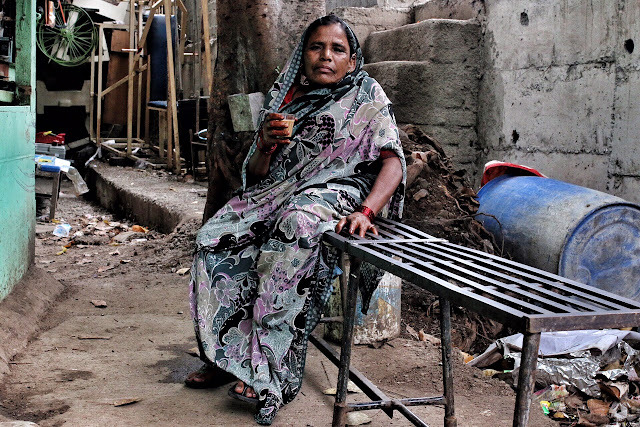 Radhabai's husband is a worker with a national political party and left her for another woman a few years after marriage. After that she raised her kids, got her two daughters married and even now works to secure the future if her grandkids. "I dream of going to Haj once in my lifetime, but it's too expensive for me right now - it costs about Rs 2.5 lakhs. But I can still go for Umra as its more affordable." Nawab bhai is one of the oldest worker of Juna Bazaar and has been working here for almost 40 years now. He has seen many changes in these years - earlier the market was just temporary structures, which later became wooden shops and now the market is fully concrete. His family comes from a village near Ahmednagar but now everyone is settled in Pune. His one son and four daughters are also now settled in the city. Whenever free, Nawab bhai goes to the mosque to pray. Earlier he used to go to theaters to watch movies, now he just watches TV at home. "I dream of living the rest of my life with full honesty and remember Allah. That's all." Firoz Khan comes from a family of painters and he spent his childhood days learning from his father who painted sign boards. He studied till grade nine, and then joined his father. However he enjoyed carpentry more, and joined his uncle's workshop and worked with him for many years. He moved to Juna Bazaar only two months back. 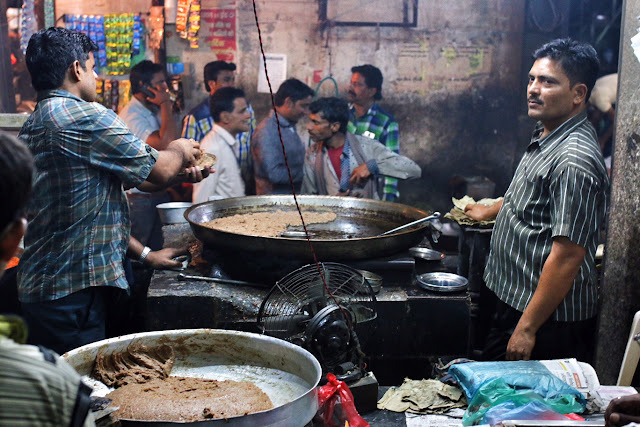 Firoz lives in a large joint family, with his sons, daughter-in-laws and grandkids. He doesn't watch movies, but has seen 'Ten Commandments' because his friend tricked him into it. He loved the movie. "My dream is just to take care of my parents. They gave me life and now it's my duty to take care of them in their old age." Before Kishan Sahu moved to Pune, he worked on a highway near the Kathmandu airport in Nepal for many years. Later he even did farming in his hometown in Bihar, but barely made a living. Later he moved to Pune with his relatives to see the place. But he found a good job in the city and decided to stay back. Later he got his wife also from the village and now they all stay together in Pune. Kishan works for ten hours as a manager in a small shop in Juna Bazaar. In his free days he likes to visit temples, especially Dagduseth Ganesh temple. "I earn very little money. I just dream of having enough food to eat well, and maybe a good house to live in." Sheikh Tahira's husband was an alcoholic and 30 years back he died due to liver failure. After that she raised her daughter as a single mother, working continuously every day. She comes from the family of painters and she learnt painting from her father. She has been doing it from the age of ten, and even now she paints military boxes at a shop in Juna Bazaar. It has been a tough life, but there were always many women like her working alongside which gave her support and strength. Now her daughter, son-in-law and their four children live with her. She never went to school but wants to ensure some education to her grandkids. "I really don't have any dream. I just come and work here to make a living. What can I dream at this age?" 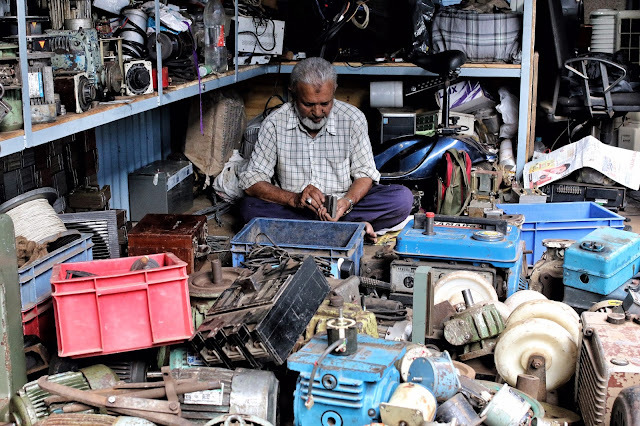 Rafiq is 47 years old and has been working at the Juna Bazaar for the last twenty years. His work mainly involves breaking things down, especially engines and other mechanical devices. As a kid he was in his family village and studied till grade eight. Family circumstances forced him to leave school and work in the fields. Then he moved to Pune to make a better living by and started working here. He has two children and they go to school. He doesn't want them to do what he does and pick up their career based on their preferences. Simple people with simple dreams. "I dream of living the rest of my life with full honesty "
Fabulous series! Love every portrait. Very nice stories and photographs. Nice to see some Pune streets in your blog.